Although college baseball lacks the fan following that football and basketball share, it is still widely considered one of the NCAA’s more popular sporting draws. Traditionally, schools in the South and the West have dominated college baseball, but a new trend is sweeping the collegiate baseball world: the emergence of academic powerhouses as baseball juggernauts. Prestigious universities such as Rice, Virginia and Vanderbilt (just to name a few) have shown that book smarts and performance on the diamond are related. But what are the reasons behind this trend? Money, for one. Rarely do NCAA baseball players receive full scholarships. College baseball programs get less full scholarships than they do players, so unlike football and basketball they have to give partial scholarships. These prominent schools tend to run on the more expensive side, so with less financial help only the more wealthy families can afford to send their athletes to these colleges. Baseball is an expensive sport to begin with. A new bat, glove, uniform and the rest of the equipment can run a family over $1,000, so you can see how the sport and money are connected. But still, money isn’t the only reason why great schools are fielding great baseball programs. Baseball has always been known as a “thinking man’s game,” and I can tell you that the moniker is true. Nobody would argue that baseball players have the most athletic prowess of any sport (although there are many very good athletes that play), but they sure have to be smart. The game is so nuanced that each little motion matters. Catchers are often the brightest players on the field. Many college catchers call their own pitches, not to mention that they have to be effective communicators as they are the only position that can see the whole field at one time. Baseball players always have to be thinking about the next play, so you can see why intelligence is a premium in the sport. The stats also back up my claim. Since 2004, the graduation rate for NCAA baseball players is at 77 percent. It would be higher, but many players go to the pros after their third year and never graduate. Still, that 77 percent is much higher than football (69 percent) and basketball (68 percent). 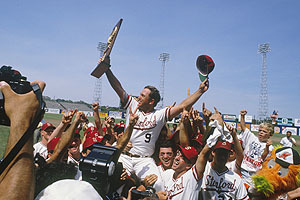 Stanford, one of the top schools in the United States, had a 100 percent graduation rate for their baseball team for the fourth straight year in 2012 – not to mention they are ranked No. 12 in the latest USA Today Coaches poll. In sports, there is a big difference between intelligence and instincts. Baseball is one of the few sports that weeds out those who don’t have both. That is not to say that basketball or football players aren’t smart; because they are. But the critical thinking that happens on the fly in baseball is unparalleled in any other sport. That is why this trend is here to stay.